[THOMAS JEFFERSON]. Newspaper. 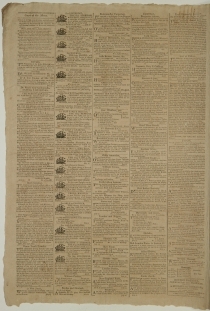 Boston Gazette, July 18, 1805. 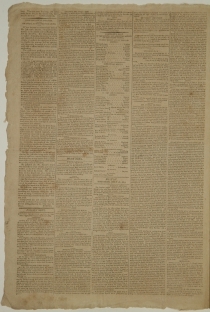 4 pp., 13½ x 20 in. It was not my intention to have noticed Mr. Jefferson’s amours.- Respect and tenderness to the injured and unoffending forbad the discussion. But when an attempt is made to demoralize the nation by a bold and unqualified avowal and justification of crimes, it ceases to be a question of delicacy, whether the attempt shall be repelled, and the people be roused to a sense of the insult that is offered to their virtue and understanding. As an introductory to a system of ethics, founded on the precepts and practice of our amiable Philosopher and rigid Moralist, this essay, at the subversion of all that is dear to man in the most interesting relations of life, will no doubt be peculiarly acceptable to the disciples of the new philosophy – In minds, however, not yet tainted with these detestable doctrines (and as such I trust the great majority is composed) it cannot fail to excite every sentiment of virtuous indignation, or to produce a correspondent expression of abhorrence and disgust. 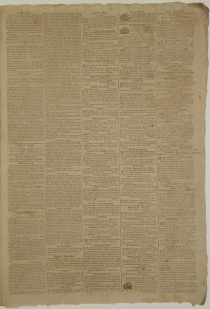 I entreat the Father of every family in the United States – I conjure every husband , Son, and Brother, to peruse the above recited article with attention – if possible, with dispassionate attention –and to say, whether the annals of the most depraved people have in any age exhibited a fouler and more scandalous attempt at national corruption and dishonor. Gracious Heaven! has the spirit of party, then so far subdued the sense of moral right in our country, that, to rescue a vile Letcher from the merited reproach, which his guilt has incurred, we are content that our national character should be branded with infamy, our morals be poisoned in their source, and proclamation made throughout the world, that the people of the united States consider a deliberate system of seduction, persisted in for years, under every aggravation of circumstances, as an affair to be justified, and even smiled at! The base idea set forth in the recited article that Mr. Jefferson, being under no matrimonial restraints, was at liberty to peruse his debauchery to any extent, that his libidinous wishes might suggest, is a false in fact as it is flagitious in sentiment. Mr. Jefferson (see Mr. Turner’s letter) was the husband of an amiable and virtuous woman at the time when he sought to seduce the wife of his friend. His obligations to that friend were of a nature not merely to have controuled his passions, but to have commanded his gratitude. His attempt, therefore, was not only an infraction of the divine and moral law; but a violation of the confidence, which a friend and benefactor had reposed in his honor. Mr. Jefferson, under any plea that he, or his minions can devise, will try in vain to invalidate this statement—even the affectation of being ‘conscious of no passion that could seduce him from his duty’ will not avail. Unimpassioned lust, and smiling vengeance were the attributes of an execrable Tyrant, not less distinguished by his folly than his crimes. At age 25, Jefferson was asked by his childhood friend John Walker to stay at his home and watch his young wife and daughter while he was away on a business trip. During the four month period Jefferson stayed with the family it is rumored that an affair or attempts at an affair by Jefferson occurred. Another rumored incident a few years later occurred when John Walker, who was still unaware of any of Jefferson’s previous attempts at his wife, and his wife came to visit Jefferson. Jefferson allegedly sought out Mrs. Walker in private and made attempts to seduce her, leaving only when Mrs. Walker threatened to scream. 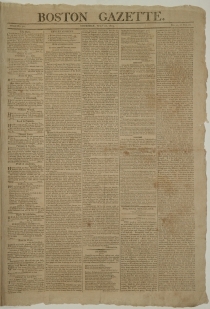 Also includes a report of the duel between Brigadier General Benjamin Smith and Captain Maurice Moore (p. 2) and a section on the effects of lightning in Hillsborough, N.H. (p. 2). Another section offers a “Complete list of the Consuls and American Agents of the United States” (p.2 col.3).